Soma is the bulbous body of a neuron (nerve cell) from which one or more processes emanate (dendrites and/or axons) and which is the part of the neuron that contains the cell nucleus enclosing a conspicuous nucleolus. The soma (pl. somata or somas) is also known as a perikaryon (pl, perikary), a cyton, or simply as a neuron cell body. The word "soma" comes from the Greek σῶμα, meaning "body," while perikaryon comes from peri, meaning "around" and kary, meaning "nucleus." The soma includes many organelles, including Nissle granules, composed predominately of rough endoplasmic reticulum and free polyribosomes. The protein- and membrane-making machinery of free ribosomes and endoplasmic reticulum in the soma is likely the most active in the human body. The Golgi apparatus is also well-developed and mitochondria are widely dispersed. However, the key feature of the soma is the cell nucleus, which is the source of most of the RNA produced in neurons. 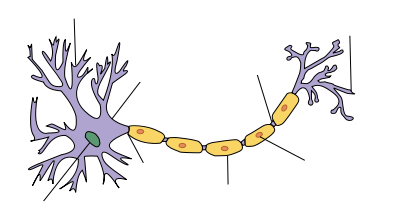 Overall, the complex coordination among the diverse parts of the soma, and between the soma and its processes (axons and dendrites), and in the cell-to-cell interactions between an individual neuron and other neurons reflects a remarkable intracellular and intercellular harmony, and one that allows the soma to advance both a maintenance function for itself and a larger function for the neuron, the nervous system, and the body. Every neuron contains a soma, or cell body. A neuron or nerve cell is a highly specialized, electrically excitable cell in the nervous system that conducts nerve impulses between different parts of the body. Neurons can process and transmit information from both internal and external environments, communicating this information via chemical or electronic impulse across a synapse (the junction between cells) and utilizing the action potential—an electrical signal that is generated by means of the electrically excitable membrane of the neuron. In vertebrate animals, neurons are the core components of the brain, spinal cord, and peripheral nerves and are typically large and complex. The three main structural regions of a typical neuron are two categories of processes (an axon, which carries an electric impulse; and one or more dendritic trees, which typically receive input) and the soma, which contains the nucleus and is the major biosynthetic center. Dendrites are the second of the two types of protoplasmic protrusions that extrude from the cell body of a neuron. These are cellular extensions with many branches and are specialized to receive chemical signals from the axon termini of other neurons. Dendrites convert these signals into small electric impulses and transmit them to the soma. 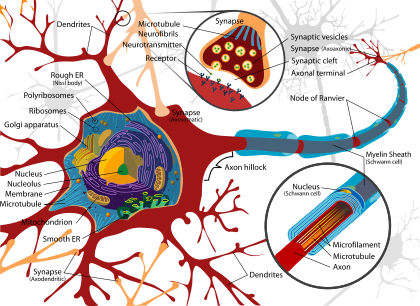 Electrical stimulation is transmitted onto dendrites by upstream neurons (usually their axons) via synapses, which are located at various points throughout the dendritic tree. Dendrites play a critical role in integrating these synaptic inputs and in determining the extent to which action potentials are produced by the neuron. Dendrites are distinguished in general from axons by several features, including shape (dendrites often taper while axons usually maintain a constant radius), length (dendrites are restricted to a small region around the cell body while axons can be much longer), and function (dendrites usually receive signals while axons usually transmit them). All of these rules have exceptions, however. For example, while the axon is generally involved in information outflow, this region can also receive input from other neurons. Information outflow from dendrites to other neurons can also occur. And axons can be very short (and even absent) in some types of neurons. 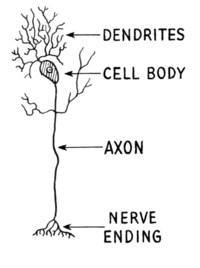 In the case of neurons without axons, the dendrites may serve the function of transmitting signals from the cell body. The soma or perikaryon is the bulbous, main part of a neuron, from which the dendrites and axon branch off. The soma contains many organelles; granules called Nissl granules; and the cell nucleus as the key feature. While both dendrites and axons tend to share the same organelles as the soma, these two processes both lack the nucleus, and axons lack Golgi apparatus and Nissl bodies that are found in dendrites and the soma. There are many different specialized types of neurons, and their sizes vary from as small as about 5 micrometers (µm) to over 10 millimeters (mm) for some of the smallest and largest neurons of invertebrates, respectively (Marieb and Hoehn 2010). The soma (main part of the neuron in which the dendrites branch off of) contains many organelles, including granules called Nissl granules, or chromatohilic substance (stains darkly with basic dyes), which are composed largely of rough endoplasmic reticulum (ER) and free polyribosomes (Squire et al. 2008; Marieb and Hoehn 2010). The protein-making and membrane-making machinery of free ribosomes and ER is likely the most active in the body (Marieb and Hoehn 2010). The Golgi apparatus is also well developed and encircles the nucleus (Marieb and Hoehn 2010). Mitochondria are dispersed among the other organelles and microtubules and neurofibrils form a network throughout the soma, maintaining cell shape (Marieb and Hoehn 2010). The cell nucleus is a key feature of the soma. The nucleus is the source of most of the RNA that is produced in neurons. In general, most proteins are produced from mRNAs that do not travel far from the cell nucleus. This creates a challenge for supplying new proteins to axon endings that can be a meter or more away from the soma. Axons contain microtubule-associated motor proteins that transport protein-containing vesicles between the soma and the synapses at the axon terminals. Such transport of molecules towards and away from the soma maintains critical cell functions. The axon hillock is a specialized domain of the neuronal cell body from which the axon originates. A high amount of protein synthesis occurs in this region, as it contains a large number of Nissl granules (which are ribosomes wrapped in RER) and polyribosomes. Within the axon hillock, materials are sorted as either items that will enter the axon (like the components of the cytoskeletal architecture of the axon, mitochondria, etc.) or will remain in the soma. In addition, the axon hillock also has a specialized plasma membrane that contains large numbers of voltage-gated ion channels, since this is most often the site of action potential initiation (Squire et al. 2008). The survival of some sensory neurons depends on axon terminals making contact with sources of survival factors that prevent apoptosis. The survival factors are neurotrophic factors, including molecules such as nerve growth factor (NGF). NGF interacts with receptors at axon terminals, and this produces a signal that must be transported up the length of the axon to the nucleus. A current theory of how such survival signals are sent from axon endings to the soma includes the idea that NGF receptors are endocytosed from the surface of axon tips and that such endocytotic vesicles are transported up the axon (Delcroix et al. 2004). In vertebrates, most of the neuron cell bodies are located in the central nervous system, protected by the bones of the vertebral column and skull. Clusters of soma in the CNS are called nuclei, whereas those positioned along the Peripheral Nervous System (PNS) nerves are called ganglia. Delcroix, J. d., J. Valletta, C. Wu, et al. 2004. Trafficking the NGF signal: Implications for normal and degenerating neurons. Prog. Brain Res. 146: 3–23. PMID 14699953. Squire, L., D. Berg, F. Bloom, S. du Lac, A. Ghosh, and N. Spitzer. 2008. Fundamental Neuroscience, 3rd ed. Academic Press. ISBN 9780123740199. This page was last modified on 11 October 2015, at 15:25.